If there is no current event in your calendar, you can press any of the colored buttons, and the phone will be placed in the selected mode for one (1) hour from “now.” Click twice and you select 2 hours, and so forth. The exception is Flight mode which will keep the phone in Flight Mode until you press any of the other mode buttons. The button places the phone back in “normal” mode. If you pressed the Vibrating mode or if there is an event (busy) in your calendar, it will look like this in the Widget. You can change the TelphCon level for the current event by pressing any other button. By clicking on the event line below the buttons, you will get to the App, where you can “fine tune” an event. How to handle your Calendar? Entering an event in the calendar where you are “available” allows TelphCon to give you a “buzz” reminder at the correct start time. Your phone will continue to “ring” as “normal”. By entering a “normal” event in the calendar, the default will probably block the time of the event and indicate that you are “busy”. 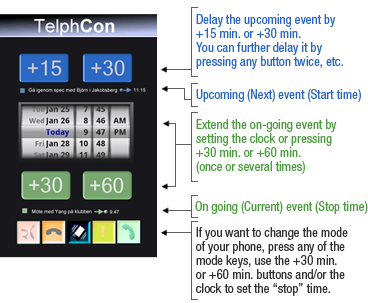 The TelphCon will automatically place your cell in vibrating mode during the time you are “busy.” At the stop time of the event, your cell will automatically revert to “normal” again. If you enter # (hash) at the beginning of the event (title) text, the TelphCon will place the phone in “dead silence” mode between the start and stop time of the event. At the stop time, the phone will automatically revert to “normal” mode.